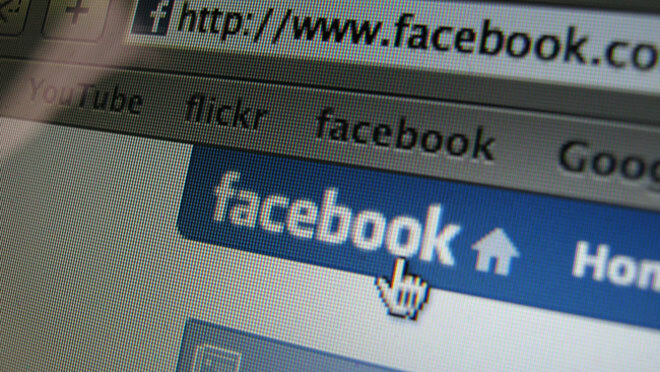 An upcoming update by Facebook will recommend a list of people you might want to follow based on which Facebook pages you currently “like”. According to Inside Facebook, this new feature-section will be located in the right-side column of a user’s active page, directing viewers to a selection of “People To Subscribe To”. If, for example, you “like” The Next Web on Facebook, the recommendation list will display several of our editors as suggestions. 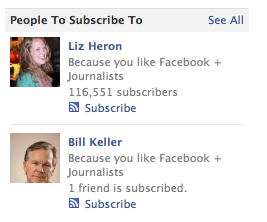 Additionally, Facebook will recommend users based on those whom your friends on the platform are subscribed to as well. For those of you who aren’t seeing this section, no worries — neither am I. The feature has yet to be rolled out to all users on the network. After the launch of Facebook’s new Subscriptions, a feature allowing users to subscribe to the public updates of those they may not actually be friends with, this new recommendation list has the potential to boost the subscription count of several notable people on the platform. In Facebook’s effort to become more asymmetrical as opposed to its once-very-private approach to sharing, this suggestive feature will more organically introduce the actual act of subscribing to those who may not have noticed it before. With this new recommendation list being introduced, it’s obvious that those who we decide to connect ourselves with on the network will greatly influence our actual user experience. This should force Facebook users to better curate content and more accurately select which brands, companies or people they’re most interested in following — though I’d wager most casual Facebook users won’t take the new features as seriously as I might. The subscriptions feature, for me, has definitely made me more selective with who I add as a friend on the network, as well as with what pages I choose to “like” on the platform. Unfortunately, this only comes after adding several strangers to my Friends List prior to the update, most of which I can’t get rid of due to limited options on Facebook. With subscriptions, you no longer have to add friends you don’t know in order to share content — but what about those of us who have already added everyone under the Sun? Facebook has mysteriously removed the option to mass-select groups of “friends” to delete, a sorting power I greatly miss, and one that makes me regret my choice to haphazardly approve every friend request I’ve ever received. Then there’s my actual Facebook Page, where over 1,000+ users have “liked” my “Public Figure” channel on the network. With the introduction of Subscriptions, this page is now obsolete for me — shouldn’t I be able to combine those who like my Facebook Fan Page with my actual profile subscribers? Subscriptions have disrupted the way I’ve already been using Facebook without giving me the option to clean up after my own mistakes. The recommended user list will be a welcome addition, but in my opinion, the platform still needs a bit of tweaking. What do you think? Are you digging the new Subscriptions feature? In your opinion, what sort of changes should Facebook implement to create a more “frictionless” experience for its users? Sound off in the comments.